Cast your mind back to New Year’s Eve of 1999/2000. What were you doing that night? How did you celebrate? What were your resolutions? It seems so long ago—some might say an eternity. The new millennium was fast approaching. People were worried about the Y2K bug (which turned out to be nothing to worry about after all). People were probably also thinking about what the new year had in store for them, along with what a new millennium might bring. With thoughts of the future, they rang in the new year at midnight. In Sydney—and broadcast around Australia and the world—the fireworks spectacular at midnight was just that: spectacular! It lasted more than 20 minutes. And as New Year’s colours rained down on the city, one word blazed out on the Sydney Harbour Bridge. A simple word in copperplate script, but an enormous concept; something really worth thinking about. It was something that was truly iconic for many Sydney-siders too. It had become a word ingrained in Sydney culture for 35 years thanks to Arthur Stace, Mr Eternity himself. Stace would write the word in chalk or crayon on footpaths around the city. 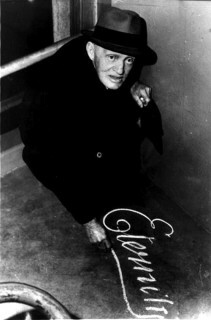 Almost every day during those years, he would spend hours hand-writing Eternity around Sydney (and sometimes further afield too). For most of that time, his identity would remain a mystery, with only a handful of people in on the secret (each of whom he’d ask, “You won’t tell anyone, will you?”). It was only in 1956 that he was “unmasked,” thanks to a publication written by his close friend and local church pastor to share his incredible story. What drove Arthur Stace to share this one-word sermon with Sydney-­siders from the 1930s to the 1960s? Was there more to him than this one hand-written dimension? What were his origins and what inspired him? All of this—and more—is covered in the recently-released and award-winning biography, Mr Eternity: The Story of Arthur Stace, by Roy Williams with Elizabeth Meyers. And what a memoir it is! Although hardly more than 240 pages in length (not counting the pages and pages of meticulously researched notes at the back for each chapter), Mr Eternity is the first-ever Stace biography and it packs a punch. I started reading the book late one evening, thinking I would just enjoy a couple of chapters and then sleep. But I was hooked and found myself reading chapter after chapter, finishing the book the same night. It really is that good. Mr Eternity shares the miraculous true story of how Stace was born into a rough family situation in remarkable poverty. He spent years as a hopeless alcoholic before transformation came into his life and he was given hope for eternity. Reading the early chapters in the book made me wonder how he was ever able to turn his life around and become someone who helped others to do the same. To say the chances of transformation were small is being generous. To say too much more would give away too much of the story, which means you’re going to have to read Mr Eternity for yourself to see just how dire things were. But it’s obvious that a big change did happen for Stace. That change was getting to know God. Chalking words around the city wasn’t the only way Stace shared his faith. He also preached on the streets, shared his story, helped at the churches he was involved with and was one to put faith into action by helping those less fortunate. What he believed wasn’t just words. It was real, it had meaning and it was alive in his everyday experience. But Mr Eternity is not Stace’s story alone. The stories of Baptist evangelist John Ridley and Anglican archdeacon RBS Hammond round out the tale, their lives intertwining with that of Stace in amazing ways that all ultimately led to a mission of sharing God in their own unique ways. Each man was very different, but they were all passionate about helping others connect with God while also helping those around them. It’s truly encouraging to read about each of them. There’s a richness and depth to Mr Eternity that is belied by its brevity. Thorough research has gone into tracing the lives and stories contained in the book. Drawing on the personal experiences of those who knew Stace—notably co-author Elizabeth Meyers, who is the daughter of May and Lisle Thompson, the pastor who wrote the publication that revealed the mystery writer of that one simple word—Mr Eternity includes information from previously unavailable sources. There are also illustrations and photos, and excerpts from Stace’s communications. These all provide valuable insight into a humble man who loved God and loved helping humanity. The final chapters provide some interesting background into how the revival of the theme of Eternity came about for Sydney in time for New Year’s Eve 1999/2000 and the 2000 Olympic Games. They also explore some of the other writings, songs, plays and more that have been created referencing Stace. There have been many myths surrounding Mr Eternity, not just in the current era, but also in his own time. One persistent myth has been that Stace was illiterate, which the biography shows is simply not true. There are others, which the book also explores and dismisses. Whatever your perceptions of Arthur Stace—this may be the first time you’ve heard of him or he might have been part of your cultural fabric—Mr Eternity will paint a fascinating picture of a life transformed with God’s help. It’s not just a book for Christians either. Anyone who enjoys history or biography will find the story intriguing. Published 50 years after the death of Arthur Stace, Mr Eternity is a timely reminder of what’s really important in life, and how any life can be changed for the better through an encounter that offers the promise of eternity.